Initially introduced into the system as the ‘SF-182 Form’, this form was built out to mimic the US Government SF-182 paper-based form. This form was once available at an additional cost (on top of the regular licensing fees) but was added into the system as standard functionality in Q3 2015 (LR-9660). 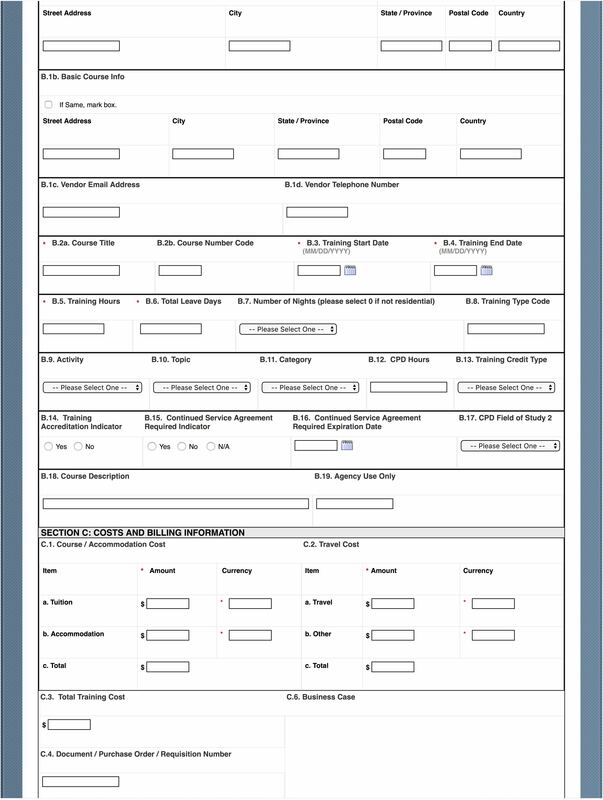 Although this form was made widely available to all customers, no attempt was made by SF to increase the customization capabilities. 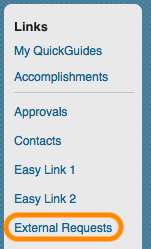 This resulted in customizations taking much longer than necessary and a form that looks very outdated. To aid in the configuration process of this form, I have compiled all of the information needed into a single blog (along with some useful tips). 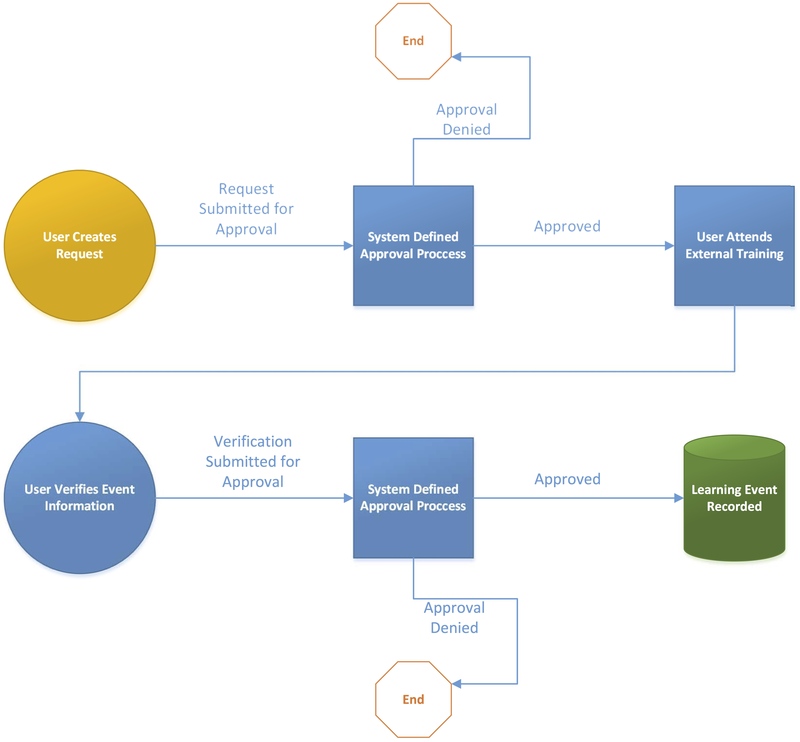 In order to visualize how the external learning request process works, a process map is most helpful. As seen in the graphic above, there are two main components that make up the external learning request process. The first being when the user creates the learning request and submits it for approval, and the second being when the user completes the course and goes back into the system to verify the information and send it off for another approval. These approval processes are set independently and can be set both system wide (In Global Variables) and more granular (In Assignment Profiles). 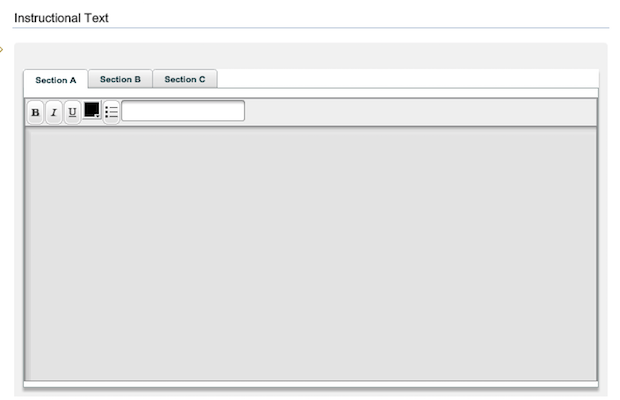 Note that the processes set at the assignment profile level override the global values. Typically both of these processes include the pm in some way but it will depend on your business needs. Ideally a budget coordinator would be included as there are financial impacts from these external learning engagements. Note: This post will not go into detail on what can / cannot be done with approval process or how to create them, however, I can provide insights in the comments below. Getting back to the point I made about this taking a long time, it is due to different labels being used from the admin screen / user screen / reports. It took many hours to find out exactly which label id’s go to which particular part of the form so I wanted to save everyone else some time and post it here. If you would like an excel version of the info please provide your email below. Discuss if change management can fill any gaps in the form (Changing your needs to match the form instead of changing the form to match your needs). If there are still gaps, use the below information to fill them. 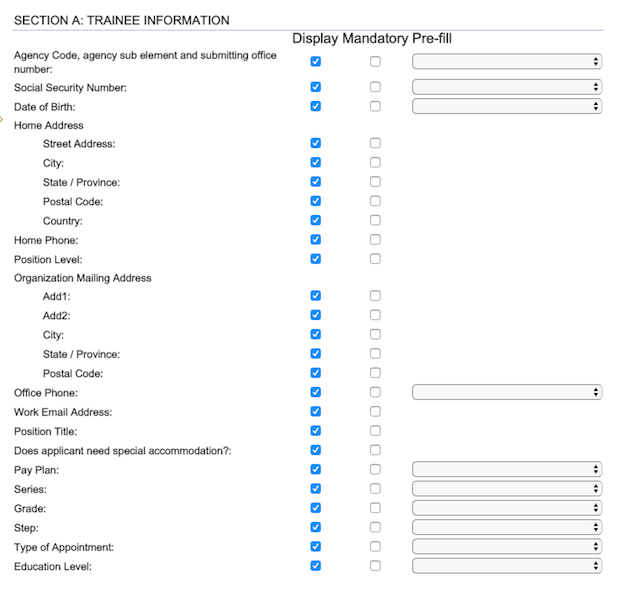 Taking the data type and form position into consideration, determine which fields can be re-labeled to meet your needs. Recognize that there are only a handful of fields that have picklists and use them wisely. Understand that the picklist values themselves can be localized to different languages. Understand that when fields are hidden, the form down not fill the white space with anything (or make the form smaller). Take into consideration if multiple currencies will be used within this form (and that the $ sign cannot be hidden or changed). Located in System Admin > Configuration > External Request the configuration options for this are minimal to say the least. Here you have options for configuring instruction text for each section as well as the visibility of most fields and whether or not they are mandatory. 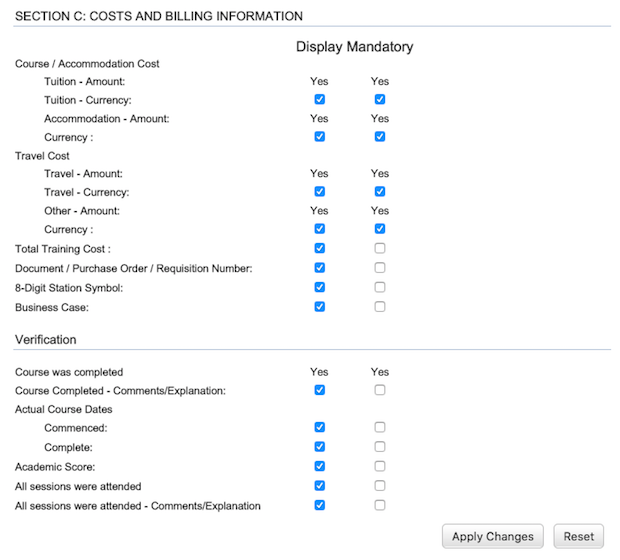 The third option, ‘Pre-fill’ shows for fields that have the ability to be pre-populated when a user creates a request based on the specified user data field. This is useful if your user data supports it, however, from what I have seen there are usually major gaps. The alternative is to not use the pre-fill and the user manually enter the data when creating the request. Note: Make sure to update the labels for all locales that are in use. In addition to the approval process configuration, you also need to make sure that the user has access to the External Request button listed in the ‘Tools’ tile. The only workflow related to this is labeled ‘Access External Learning Requests’ and you need to make sure this is added to the user role that the user is assigned. Assuming you followed this guide and changed the admin labels to match your requirements first, you now need to mimic the changes onto the actual form that the user sees. All of the label id’s needed are listed below. The ‘External Request Data’ report is an out-of-the-box report, which is available in multiple formats (CSV, HTML, PDF). If any label changes are made to the user or admin screens, you will most likely need to update the labels that are being pulled into the report header section. In order to aide this process, I have created a list of these report header values along with their respective label id. Thanks for this great config document. This is really helpful and yes it took me also several hours to retrieve all the label id’s. You statet that you cannot change the $ sign. Furhermore: it is not possbile to delete external request forms, keep this in mind when testing/working in the Production environment. 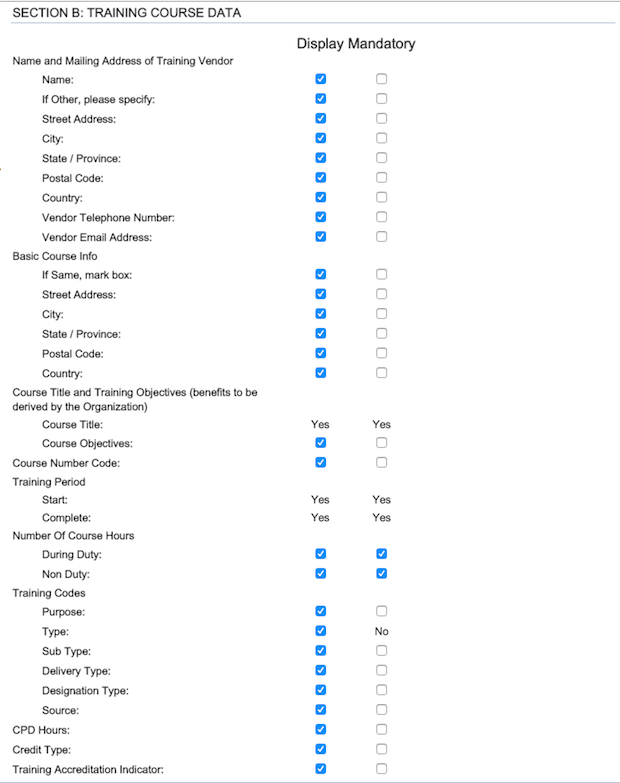 Hello Bas – It was a while back when I did these configurations for a client and at the time the dollar sign was static on the verification page (although the label would update on the actual form). Testing now it appears that they have resolved this. Thanks for adding to the post! @Bas- Did you manage to change the currency symbol? I was not able to find the label you mentioned in the system. Would it be possible for you to share some screenshot or guide a bit in details how we can achieve this? SAP is saying that we can’t amend the currency Symbol. Underneath an example where I changed dollar into Euro. 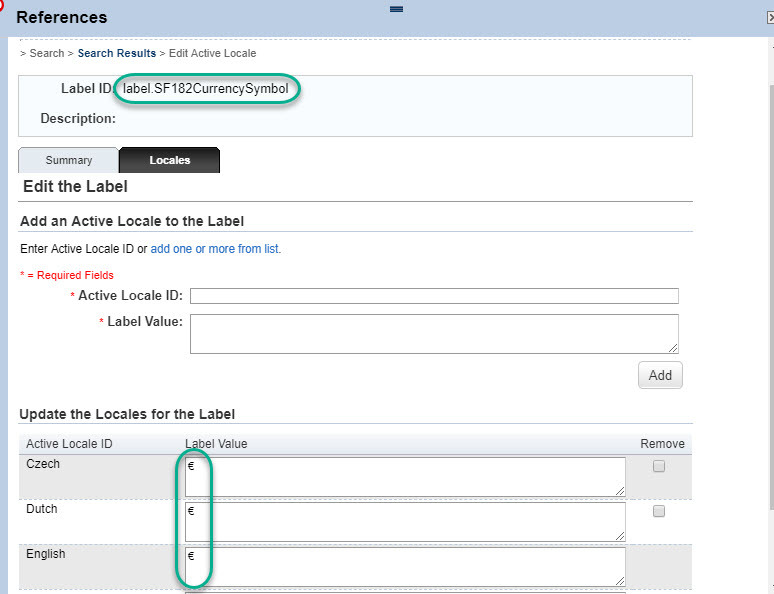 I am not able to find label – label.SF182CurrencySymbol. Please let me know where you done the changes to the currency symbol. Thank you for creating this blog. You mention that you will won’t go into detail about the approval process and to use the comment section to ask questions. 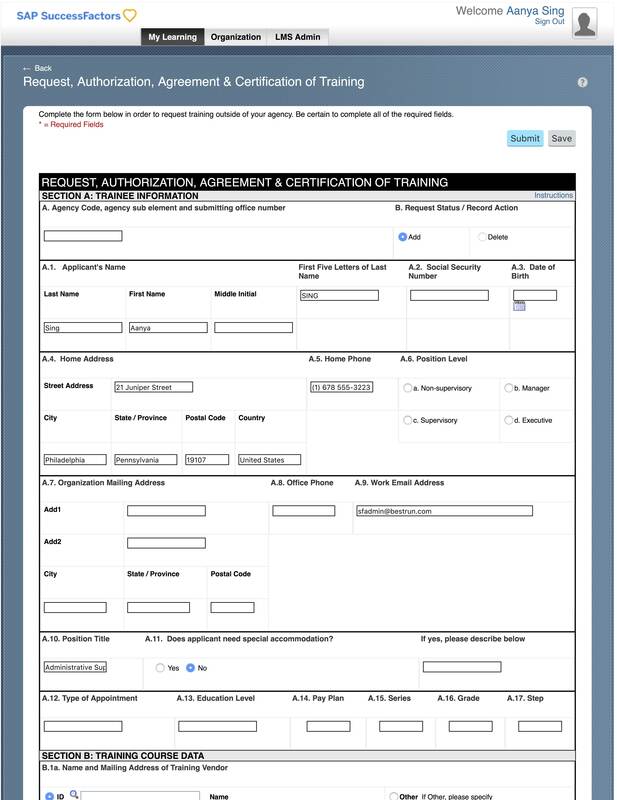 With this form, is it possible to configure the approval process for different scenarios? For example, our company allows a manager’s approval (one level) for any courses costing $5000 and less. But we would like to see a two level approval for any courses that are $5000 and greater, is it possible to have both approval processes? Hello Stephanie – We are only able to configure an approval process for the initial approval and then a separate approval for the verification fo the event. It is unfortunately not possible to trigger different processes based on the amounts. This would need to be handled outside of the system (By the manager contact the next level of approval if the course is over the $5000). If you create an assignment profile you can navigate to the Related Area where you will find the tab ‘External Requests’. In theory you could match different groups of users to different approval processes in the submission and verification phase. However this still doesn’t solve the problem of handling different amounts, but you might differentiate your users into groups with multiple approval processes.